Facebook Timeline: You may have been wondering if it is possible to stop people from posting on your Facebook timeline, a lot of my friends have been asking me if it is possible and how they can apply such settings if it is actually possible. Yes! It is very possible to totally stop people from posting on your Facebook timeline, you can even decide who can see what others posted on their timeline, review posts tagged you in before they can appear on your timeline, who can see posts you’ve been tagged on etc. For the basis of this post, I will be concentrating on those of you who have migrated to the new Facebook Timeline, if you have not migrated to the new Facebook Timeline, check out my earlier blog post called “ The new Facebook Timeline” and find out how you can migrate today. How to stop people from posting on your Facebook Timeline: For whatever reasons best known to you, you have decided to stop people from posting on your Facebook Timeline, follow the simple steps below and set your profile so that people cannot post on your Facebook Timeline again. On the far right top corner where you have your little profile picture, Home and a down-pointing arrow. Under who can see what posts on your timeline, it is public by default, if you want friends of friends to see it, you choose friends of friends, if you want just only your friends to see it you choose friends, if you don’t want anyone at all except you to see it you choose only me. You can use the custom settings to choose specifically who can see or who cannot see what others posted on your timeline. Review posts friends tag you in before they appear on your timeline is by default “off” if you want to enable it click on the “off” and it will take you to a page where you can enable it and save. Who can see posts you’ve been tagged in on your timeline can be configured pretty much the same way we configured who can see what others post on your timeline above on step 7.
Review tags friends add to your own posts on Facebook is just like step 8 above. Who sees tag suggestions when photos that look like you are uploaded can be configured to either be friends or no one. 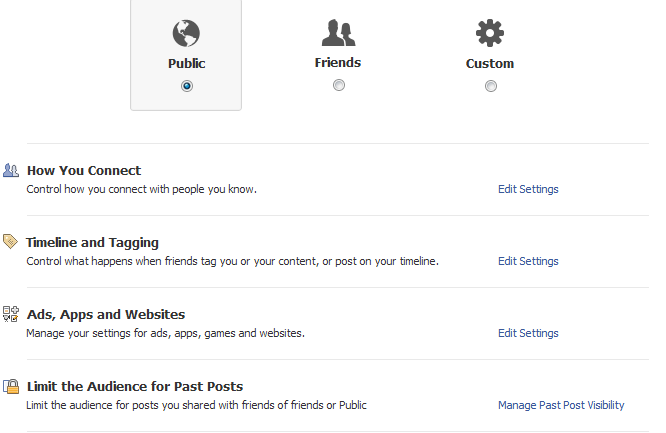 When you are done with the above settings as it suits you, click done below and go back to your Facebook timeline. I hope you find this blog post interesting, tell me what you think about it with the comment box below. Feel free to share this post with your friends. Remember toSubscribe to NetMediaBlog Feeds by Email. Am glad you appreciate the post…..remember to share with your friends. Whether its a personal profile or Page there is privacy levels for every type of profile in Facebook. Simply go to the page, look for edit page and choose the “Manage Permissions” option from the dropdown. Then unmark the “Everyone can post on (Page)’s timeline” where page is the name of the Facebook Page, you can also untick the Everyone can add photos and videos option and save.